SEMRush, a tool for Google organic and AdWords competitors keywords research, was found by the team of SeoDigger and SEO Quake FireFox plugin. SEMRush keep track over 35 million domains and 80 million popular keywords with 8 databases to collect Google search results. SEMRush can show you keywords for any domain ranked high enough to be in top 20 search results results or that purchases AdWords. SEMRush is a useful SEO business tool, providing an efficient way to research competition and check the rankings of a website in order to meet optimization standards above your competitors. The database can span across more than 35 million domains to analyze Google search results and shows related keywords for any domain that ranks high enough to be in the top 20 search or AdWords results. SEMRush has both free and monthly charge paid plans. You can check up to 10,000 results per domain, 3,000 queries per day, plus API access; and export reports to CSV and XLS for just $49.95/mo. Have a look of WebmasterCrunch.com right now! 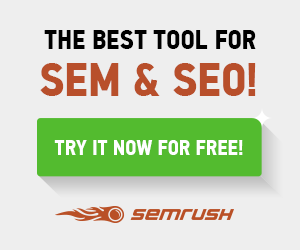 SEMRush is the new tool for Search Engine Marketing. US database with 40 000 000 keywords. You can learn everything about your competitors! IS THERE A FREE TOOL THAT SHOWS A COMPETITOR’S PPC ? There is a new tool inside Adwords that gives you info on who is competing with you on Adwords PPC, and what percentage of the time they appear compared to you. Unfortunately it only works for one keyword at a time, and does not give bid prices, but it’s still a useful resource. Hey there! Quick question that’s completely off topic. Do you know how to make your site mobile friendly? My blog looks weird when browsing from my iphone 4. I’m trying to find a template or plugin that might be able to resolve this issue.